Are you gearing up for a road trip this Easter? With many of us taking our first trip to the airport, seaside or campsite for Easter, it's the ideal time to ensure that your tyres are also up to the trip. Every day we see vehicles with illegal tyres driven into our centres which is not only risking points on your licence and a fine but it's also risking the safety of you and your passengers. Easter weekend is one of the busiest times on the road during Spring and with it usually comes damp road conditions, couple these with worn tyres and you could struggle to stop in plenty of time or find yourself slipping when pulling away or cornering. We've got some great Easter Offers & Discounts running from 15th - 30th April 2019, whether you are looking to purchase online or in store we'll give you a great deal on your tyres. All that you need to do to take advantage of our in store offers, is to download your voucher below and show it to the centre manager of your local Just Tyres, they'll adjust your final invoice accordingly. Looking to purchase online? We're offering a 5% discount when you purchase 2 or more selected tyres in one transaction via our website and you can still have them fitted at any of our 37 centres throughout the UK. Simply add 2 or more selected tyres to your basket and we'll automatically discount your purchase before checkout. customers only (excludes company vehicle drivers). by any other requirements set out in the promotional material. 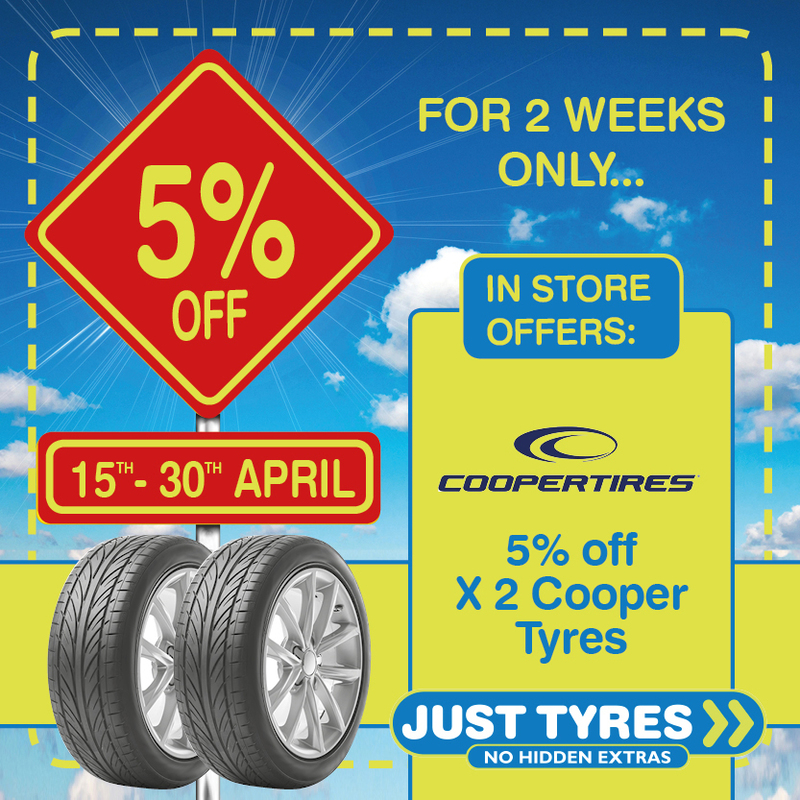 Purchase 2 Cooper tyres in store to qualify for a 5% discount with your downloaded or printed voucher, which must be shown to the Centre Manager at the point of purchase. 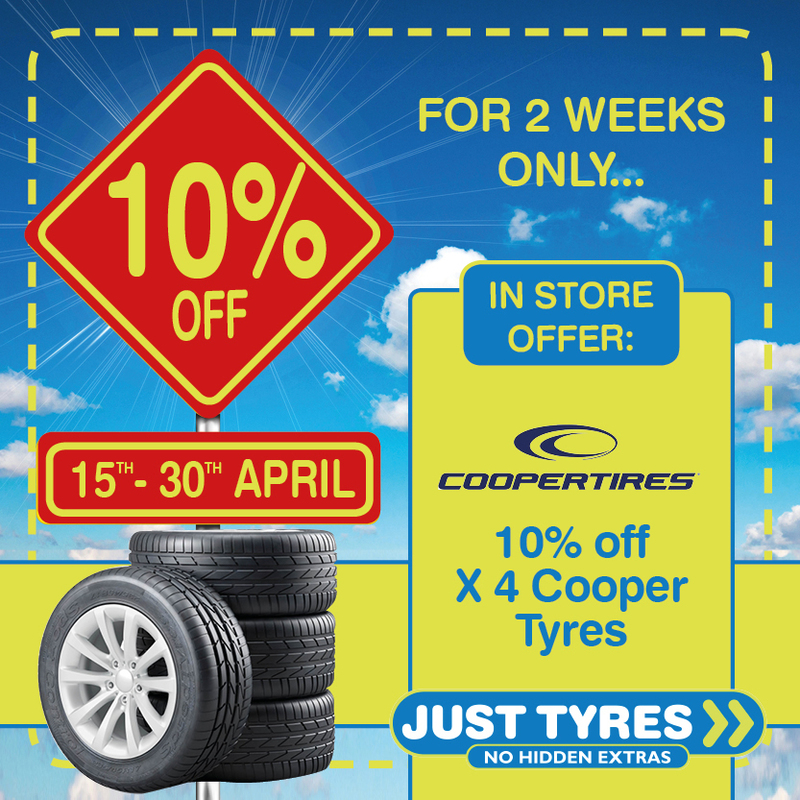 Purchase 4 Cooper tyres in store to qualify for a 10% discount with your downloaded or printed voucher, which must be shown to the Centre Manager at the point of purchase. Purchase 2 or more selected tyres online to qualify for a 5% discount, please note that this offer is not valid against any Michelin or Goodyear tyres or any brand of runflat tyres. 4. The Easter campaign runs from 15th to 30th April 2019 inclusive and purchases must be made in one transaction during this time to qualify for the free gift or discount. 5. 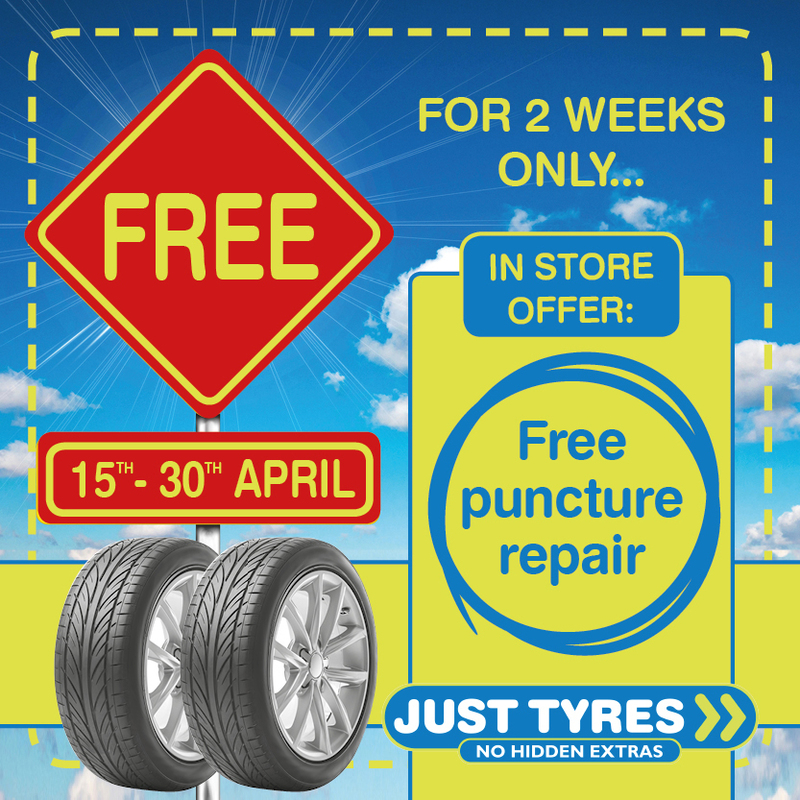 Free puncture repair is only valid during the promotional period and must be downloaded or printed and shown to the Centre Manager at the point of repair. Please note that not all punctures are repairable; your local Just Tyres centre will be able to confirm. The cost of a new standard valve or balancing is not included in this free promotion, it is only valid for the actual repair. 7. Closing tyre purchase date is 30/04/2019. 8. Only one claim per vehicle is permitted. Entry into this Promotion cannot be in conjunction with any other offers, including advertised prices in store. 10. The incentive is non-transferable and no cash alternative will be offered.